Being one of the few MOBAs that doesn't make me angry or feel incredibly stupid (often at the same time), it's nice to see that Awesomenauts still has the playerbase to justify an expansion. 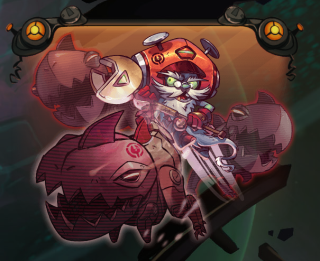 Awesomenauts: Overdrive will arrive early in the new year packing premium and free components. For those dropping cash (£6/$9), there are three new heroes: Professor Milton Yoolip, a scientist who looks to be in command of mecha-saurs; Chucho Krokk, a bounty hunter who rides a hyperbike; and twin babies Jimmy and Amy, who pilot a death-bot. The game as a whole will get substantial tweaks to encourage more team play. Details are light on this point beyond the statement that patch 2.13's XP and leveling changes were the first of many similar updates to come. Matchmaking is also in line for an overhaul and will assemble a pool of players to match instead of allocating games on a first-come, first-served basis as it does at present. Late joining matches will be removed, but games can be re-joined after disconnecting. There's more free stuff! Starstorm Station map is actually playable now in custom matches in a pre-alpha state, but Overdrive will patch it into the mainstream. The big draws on Starstorm are its wormholes and the bottomless space under the map (protip: hazardous to health). Finally, Ix the Interloper, the product of autumn's Design-Your-Naut 2 contest, will be added as a free hero. Ix can link to other heroes, healing or damaging them and switching places on command.